In Praise of Defeat. Abellatif Laâbi. Translated from the French by Donald Nicholson-Smith. Archipelago Books. Brooklyn, New York. 2016. There are many joys associated with doing Today's book of poetry but there is also a little pain, we are constantly rediscovering and confirming our vast ignorance. Until Abdellatif Laâbi's In Praise of Defeat landed on our desk we had never heard of the major francophone voice of Moroccan poetry. In Praise of Defeat brings together work from fifteen or more of Abdellatif Laâbi's books of poetry. Was it T.S. Eliot or Ezra Pound who wrote about "perfecting the language of the tribe?" I think it was Pound. Well he wasn't alone. Moroccan exile Laâbi has perfected a certain sort of precision in bringing us from his childhood in Fez to his forced exile in modern Paris. In Praise of Defeat includes poems that encompass the period from 1965 right up to 2014 and it is an enormous tome coming in at over 800 pages plus. Laâbi gives us his mandate coming right out of the gate in his long poem "Chronicle of the Citadel of Exile" where he tells us to "Write, write, never stop." "Chronicle of the Citadel of Exile" is a true monster list poem and you all know how much we love those here, but at a whopping thirteen pages we just couldn't reproduce it. Most contemporary poets have never had to face the challenges like those that have faced Abdellatif Laâbi. None of my contemporaries have ever gone to prison for the political action of being a poet. Although a few of them have been behind bars. Laâbi spent several years in prison and then was exiled. Through it his poetry has remained distinctly humane, reachable, direct and impassioned. Somehow Laâbi has been able to find light in a world determined to regale the force of darkness. has no secrets for me"
and I give my life to you?" Today's book of poetry is thrilled to share another Archipelago Books treasure, this Brooklyn publisher consistently pumps out classics from around the world of poetry and exposes them to North American readers. In Praise of Defeat was translated by Donald Nicholson-Smith and the translation is seamless, invisible mending so to speak. Laâbi's poems read and sound like they were written in English, all these uncompromising and tender love letters to his readers sound as natural as daybreak. or "written in a book"
Abdellatif Laâbi's long poems are giant quilts of both comfort and instruction, bitter blankets of bitter defeats and regret. Laâbi is a narrative monster and we were happy to hang on for the ride. Today's book of poetry might have mentioned this before, perhaps not, but many years ago I had the honour of meeting George Faludy and hearing him read. Well I haven't met Abdellatif Laâbi but I get the same gracious, intelligent and humble vibe from In Praise of Defeat as I did all those years ago sitting at Faludy's feet. Prince's of peace, gentle scribes, fierce poets. In Praise of Defeat is going to improve every poetry collection it joins. Keeping pace with the long poems that are Abdellatif Laâbi's distinctive achievement – the poems of torture and imprisonment in Morocco, or 'People of Madrid, Pardon' written in response to the train bombings of 2004 – an English-speaking reader like me inevitably keeps waiting for the public voice, the high style of anger and compassion, to falter or overreach. But Laâbi's voice does neither. Donald Nicholson-Smith's translations hold fast to this poetry's unnerving eloquence and simplicity, and its hell-for-leather speed. As the new collection In Praise of Defeat, deftly translated by Donald Nicholson-Smith, shows, Laâbi’s early poems are poems of protest and of incarceration. They powerfully evoke the need for poetry to bear witness...In Praise of Defeat presents a poet-activist who was born in the direst possible circumstances, survived them, and has continued on a trajectory of art and activism. He shows any poet how the artistic space created by “poet, activist, former prisoner, exile” is the space where the most crucial acts of art happen. The Earth Gods Are Coming. Gabe Foreman. Baseline Press. London, Ontario. 2016.
it is not like electricity, it is electricity...."
"At the End of the Mechanical Age"
Today's book of poetry was terribly fond of Gabe Foreman's A Complete Encyclopedia of Different Types of People (Coach House Press, 2011), so when we saw The Earth Gods Are Coming come through our poetry door we knew what we were getting into. Foreman continues to write with one foot firmly planted on terra firma and the other in a variety of parallel and non-parallel worlds. The Earth Gods Are Coming has an entirely disproportionate serving of intelligent whimsy. Gabe Foreman is all about the "what if" universe. The poems in this volume don't have titles. Some songs were in the key of Lord Byron. and held it to our faces. Poke rivals with those keen little stars. in half, with your naked foot. A cough, spread-eagling through the cove at low tide. preying on incantations of your face expelled by the tiny lungs of songbirds. At least not mentally real. to sing about the moon. "The moon beams are rafters branching over," etc. when you come over," etc. across a dumpster's busted radio. who crash into motels already on fire. According to Foreman we might find some light in the Dead Sea scrolls, Ninja campers and corn-dogs. Talking oxen will relax our minds and ancient Mayans await pilgrims arriving in taxi cabs. His random and encyclopedic flashes of brain lightning all point in the same direction, to grace, to electricity. that I smashed when I was dying. but it comes with a curse. a hex both banal and morose? Our morning read was big fun. Even though no one has seen the sun for a couple of days there is an unmistakable optimism that only arrives with the smell of spring. Hard to know for sure if Gabe Foreman is an optimist but when my staff had finished reading The Earth Gods Are Coming aloud to each other they were all smiling. the babies that we had planned to have once the power came back on. became an older man for the rest of her life. marriage. More a curse than a gift really. Gabe Foreman's considerable charms are almost too grand for a chapbook but Saint Karen of Schindler seems to be able to carry any weight with her marvelous Baseline Press. Schindler continues to produce chapbooks of subtle and exacting beauty and fills them with poetry worthy of the splendor. Today's book of poetry is a sucker for certain things and the Japanese Uzumaki tissue used to make the flyleaves for The Earth Gods Are Coming is beautiful enough to make you cry. Gabe Foreman's The Earth Gods Are Coming reads like a much larger book, good poems do that. TPV Spring 2012: Gabe Foreman "Should I listen to this ox?" Star Journal - Selected Poems. Christopher Buckley. Pitt Poetry Series. University of Pittsburgh Press. Pittsburgh, Pennsylvania. 2016. 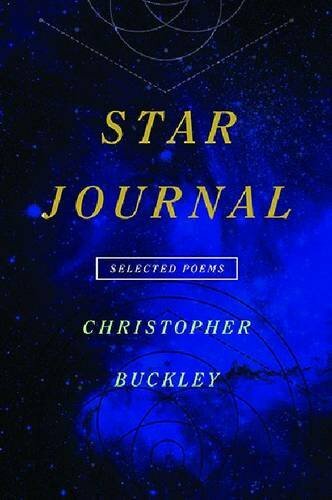 Star Journal - Selected Poems by Christopher Buckley is as straightforward as a yardstick, measuring by star-light, the weight of a butterfly heart. In fact Star Journal is a book of poet magic, a proverbial pot of gold. Today's book of poetry defies you to open any page of this book and not be entertained and enlightened. I don't hear 'em but I certainly feel the ghosts of Woody Guthrie and Will Rogers in the elusive space in the English language where intellect and emotion get to tango it out in an invisible swirl of yin and yang. Here is a poet with a giant poet clock time machine, metronomes of logic, tiny unseen hammers of reason, all of ticking away in balance inside the Buckley noggin'. Today's book of poetry couldn't help but think cinematic when reading these expansive certainties. There were moments of complete satisfaction, just like watching a Francis Ford Coppola movie where all the details are exact, all the details make it true. Buckley does the same thing, makes sure you are hearing the right sound, fills the mirror in the corner with the proper reflection, colours in the edges of the image until you are there breathing it in. in the war films of our regimented youth. the last air out of their slight necks. he hasn't hunted in years... and that once was enough for me. yellow meadowlarks scrounge fields in the grey autumn light. that it was simply because we had the guns, because we could. Christopher Buckley's poems are small stories that spin out so large you can't help but get caught up in the vortex, they becomes proclamations without ever proselytizing. We can almost believe that Christopher Buckley has our planet sussed out, or at least our meagre scrabbling over its surface. But in truth Buckley is asking as many questions as your average skeptic. Range. Good poets have range and Buckley covers it. We are subject to musings on Mao Tse-Tung, a beautiful blue evening in Santorini, Bertrand Russell's musings on astronomy, reading/not reading Einstein, dancing "the Stroll," and so on. These poems swell with the lovely interconnectivity of a man full of ideas, Buckley encompasses a big universe and he does it in big, big poems of staggering beauty and subtle intellect. When you're reading these poems you are taking in a lot of new information but it is coming through the Buckley filter. watchful, lying in wait for ourselves. on to the grass and walks. the earth still looks inescapable from here. of the more fashionable birds. content and have their say. praising the fruits of the sea. arranging oranges in a bowl. Buckley's Star Journal made for a great morning read in the office today. His poems read like tidy little novels so the reader has time to sink their teeth in. Christopher Buckley keeps a narrative line strong enough to climb up the side of a mountain with, or pull shipwrecked survivors from the sea. He keeps it taut. Buckley's narrative line is strong enough to be a lifeline, you could hang your hat on it. tiene dos rios contra muchos mares. Vallejo wrote that with God we are all orphans. and so I do it. for pork bellies, soy bean futures. There are 900 thousand Avon Ladies in Brazil. selling their kidneys, anything that is briefly theirs. we share--it devours the beginning and the end. not one metaphorical bread crumb in tow. on the outskirts of Cleveland. or joy, each one of which is closer to God than I. Star Journal - Selected Poems is a big book full of big ideas and Today's book of poetry loved it. The personal and political merge as Buckley storms over the horizon. Today's book of poetry will be down for anything Christopher Buckley wants to cook from now till the end. Buckley burns with the best. "There is a quietness to these poems and breakouts of lyrical intensity that define Buckley as a master of the art." The Art of the Lathe. B.H. Fairchild. Alice James Books. University of Maine at Farmington. Farmington, Maine. 1998. For many knowledgeable poetry fans it will be old news that B.H. Fairchild's The Art of the Lathe is a contemporary classic. Today's book of poetry got Fairchild's gem in the mail yesterday and as a result we are sailing slightly off course today. With our vast resources Today's book of poetry has started to gather foreign correspondents. We currently have Otis wandering through the poetry cellars of Sicily searching for treasure, he will be returning soon. Our latest addition to the staff is a trumpet playing be-bop artist from St. Louis, Mark Twang. Mark grew up in reasonably normal environs but somewhere early on someone dropped a Pork Pie hat on his noggin' and he hasn't been quite right since. Twang has been raiding his own vast library to send pieces of gold north. Twang sent David Lee to our door and you will be hearing much more about Mr. Lee in the near future because he is a monster. We had a thing, instantly, for David Lee. So we put him in the system. The system wouldn't wait for B.H. 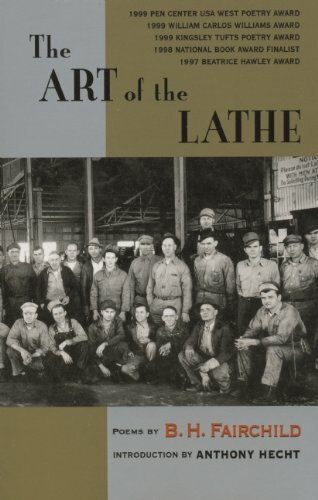 Fairchild's The Art of the Lathe. Today's book of poetry apologizes for not having read it before but you simply can't read everything, or find it. Twang had sent us individual poems by B.H. Fairchild in his letters, along with quotes from Sonny Rollins and a couple of Crying Charlies. Today's book of poetry was instantly convinced by those poems. When The Art of the Lathe arrived we knew no one would object if Fairchild skipped his place in line. The Art of the Lathe is an eye-opening deal breaker of extraordinary beauty. Fairchild uses some deep sonar of the human spirit to get inside of the reader and then sets off bombs of reason. The Art of the Lathe is the real deal. When Twang sent it to us he included a note where he suggested that The Art of the Lathe may be the best, pound for pound, book of poetry he has ever read. I happen to know for a fact that Mark Twang has read, and understood, more poetry than I have so I take his opinion to heart. That and he's been right about everything else he has told us. So when The Art of the Lathe arrived I dug in. Dear reader please believe me when I tell you that Mark Twang was right as rain. The Art of the Lathe may be the finest book of poetry I've ever had the pleasure of reading. he's only fifteen years old, and at least he'll make a game. so what, let's play some goddamned baseball here. high and big and sweet. The left fielder just stands there, frozen. As if this isn't enough, the next time up he bats left-handed. Mickey Mantle. And that's the story, and those are the facts. as if it were V-Day all over again. But they did not. Today's book of poetry isn't much of a baseball fan and suspect that many of you aren't big ball fans either but we do know how difficult it is to dream the real thoughts of men and women and make them more than real on the page. When Fairchild gets through with you it is almost possible to believe that the stories in his poems are your own experience. As a recent convert to the House of Fairchild I have assigned Milo, our head tech, the task of filling all the missing Fairchild spaces on our racks. He was able to find a copy of Fairchild's Early Occult Memory Systems of the Lower Midwest (W.W. Norton Books, 2003) on the shelves but that won't ever be enough. I knew him. He ran the lathe next to mine. smiling like a man asleep, dreaming. dirty girl with booze breath and bad manners. rich as brass rivets rolling down a tin roof. like shooting stars through the shadows. collapsed from breathing in a life of work. Lying there, his hands are what I can't forget. B.H. Fairchild had some very rapt ears on his work this morning. It is bitterly cold here in Ottawa today but our reading helped to heat up the office. Milo, our head tech, was very dignified, Kathleen, our Jr. Editor, gushed. Max, our Sr. Editor, harrumphed as he marched out into the cold but he was smiling when he marched back in. Max gave us a world-class reading of "Body and Soul", Odin grinned from the corner. Our foreign correspondent Otis is still in Sicily checking out wine cellars but he's scheduled to return later this week. Otis also sent a note making sure I included him when the staff here at Today's book of poetry welcomed our newest member, Mark Twang. After reading B.H. Fairchild's The Art of the Lathe I am now considering making all of our future staff take an oath of office by swearing on Fairchild. Leonardo imagined the first one. illustrated in Plumier's L'art de tourner en perfection. his students Roberts, Fox, Clement, Whitworth. tapping the big lightly with their fingertips. then breaking over bevel and ridge. Oil and water splash over the whitening bit, hissing. The lathe on night-shift, moonlight silvering the bed-ways. shapely hand movements. Craft by repetition. Haig and Haig behind the tool chest. in the foreground a mandrel lathe turned by a boy. the gasp and heave of the bellows. Couperin, maybe, a Bach toccata--from a window overhead. Music, he thinks, the beautiful. Tavern doors open. Voices. Grab and hustle of the street. Cart wheels. The small room of his life. The darkening sky. the fit and mesh of gears, tooth in groove like interlaced fingers. I Fall To Pieces. Sparrows bicker overhead. Screed of the grinder, the bandsaw's groan and wail. solid yet miraculous, a resurrected body, floating above the city. the ruffling of wings like a quilt flung over a bed. Snow settles on the tops of cans, black rings in a white field. The stock, cut clean, gleams under lamplight. emptiness, wholeness; a cave, a cathedral. the simple task of the Madonna's shawl. a lathe: the spindle, bit, and treadle, the gleam of brass. Today's book of poetry is thrilled to travel back to 1998 to bring you this masterwork. Make no mistake, B.H. Fairchild's The Art of the Lathe is as good as it gets. B. H. Fairchild, the author of several acclaimed poetry collections and a recipient of Guggenheim and NEA fellowships, has been a finalist for the National Book Award and winner of the William Carlos Williams Award, the National Book Critics Circle Award, and the Bobbitt National Prize. He teaches in the creative writing PhD program at the University of North Texas.